I’ve been thinking about activism for weeks, trying to work out how to be at least a little more active in 2019. In March last year I went to An Evening with Laura Bates, where she was speaking for the launch of Misogynation. Laura talked about the need to have proof and be well-informed in order to make your argument count. I was struck by just how eloquently she spoke and how she always had the numbers to hand – she moved all of her arguments from feeling familiar but individual to being part of a pattern of behaviour and a wider system in society. Something I’ve noticed in my own discussions on inequality is that there’s no shortage of people telling you everything’s fine, that really it’s the victim’s fault, that women just aren’t as strong/effective/logical/. Even when you have your own experience to draw on it’s very quickly dismissed as an isolated incident. And the only way to beat vague, clichéd old tripe like these kinds of comments is to have the material to contradict them. 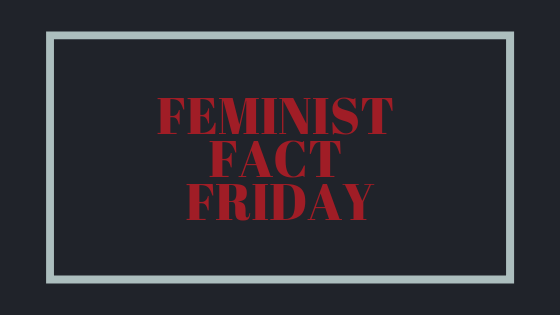 So I’m starting Feminist Fact Friday for myself, with the aim of having 52 facts, stats and stories memorised by the end of the year (well actually, by the end of January 2020) and posting them on here and on my social channels to keep myself accountable. I’ll be covering a range of themes I think illustrate the continuing state of gender inequality and the difficulties people face due to these issues. I firmly believe that equality is good for everyone – and in 12 months’ time I want to be able to argue that more eloquently and in a better informed way than I can right now. What you can do about it – because hope. Number 4? Where possible I’ll be suggesting ways anyone who is reading can try to make a difference in their own way – and hopefully that’ll lead me to putting my money where my mouth is too. Week 1 – Only 24% of the world’s parliamentarians are women. Week 2 – Only 32% of MPs are women. Week 3 – Only 4% of MPs are women of colour. Week 4 – Black and Asian women MPs abused more online. Week 5 – Laura Bates, founder of Everyday Sexism site, which received 100k entries in first three years. Week 6 – Karen Blackett OBE, widely seen as the most important agency leader in the British ad industry. Week 7 – Marc Benioff, paid $6 million to fix the gender pay gap at Salesforce. Week 8 – Gina Martin, changed the law to make upskirting illegal. Week 9 – Dame Stephanie Shirley created an all-women software company in the 1960s which was eventually valued at $3 billion.